Just to the north and west of Lincoln sits the village of Malcolm with an estimated population of around 400. On Thursday, most of that community will relocate to CHI Health Center Omaha, the site of this year’s volleyball showdown between No. 7 Nebraska (4-1) and No. 14 Creighton (4-2). Malcolm High School, with a ninth-through-12th grade enrollment of around 200, has produced two high-level volleyball players in the past two years — Hayley Densberger and Jaela Zimmerman — and on Thursday, those two will line up on opposite sides of the net for the the first time, with most of Malcolm in the stands cheering them on. Densberger, a sophomore at Nebraska, is a Malcolm native whose mother works at the school. Like many young girls in the state, she grew up dreaming of one day being a Husker, but it wasn’t until her junior season, thanks to some encouragement from her coaches, that she really started to think she could make that dream a reality. Dan Mader, a grad assistant at Nebraska from 2013 to 2015 who was also the master coach for VCNebraska (Densberger’s club program), put her on Coach John Cook’s radar. She committed to walk on at Nebraska prior to her senior year. The decision wasn’t easy, though. Densberger was an outside hitter in high school, but at 5-foot-9, that wasn’t an option for her at the next level if she wanted to play at Nebraska. She turned down scholarship offers and the chance to hit at lower levels to stay home and play in the back row for the Huskers. She saw the court in 30 matches during her freshman year as a serving specialist, and this season she’s playing three rotations as a defensive specialist. She has 25 digs on the season and is coming off one of the best serving weekends he’s seen. Zimmerman was a different story. She grew up in Lincoln but followed in her older siblings' footsteps and attended Malcolm for school. Her parents went to a small school themselves and wanted their children to have a similar experience. Listed at 6-foot-2, height wasn’t ever going to hold her back like it might have Densberger. 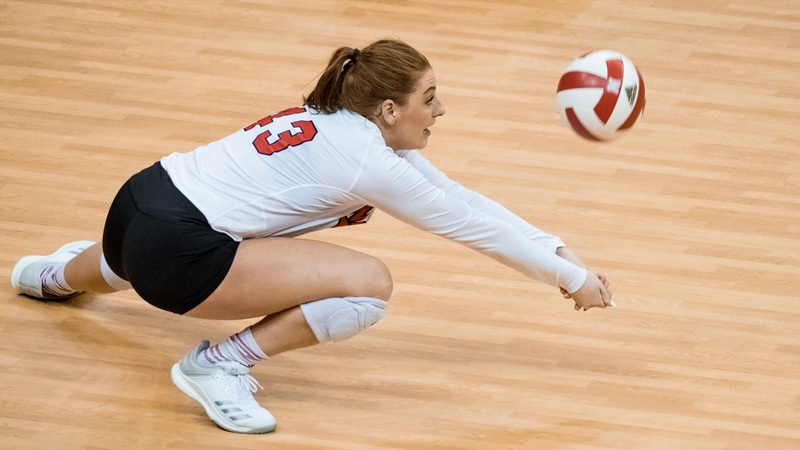 She blew up into a highly-touted recruit, twice earning All-America honors from PrepVolleyball.com and landing inside the site’s top 50 prospects in the 2018 class. The Huskers showed interest in her early; in fact, Nebraska was the second school from which she received a letter. However, she fell in love with the school 60 miles away. She committed to Coach Kirsten Bernthal Booth a few months before Densberger committed to Nebraska, despite being a year younger. Zimmerman and her younger brother, Clayton, watched a lot of volleyball together growing up, and last season that meant she got a chance to see her former teammate play on the big stage a number of times, including in the 2017 national championship. Zimmerman and the Clippers had a basketball game the day of the match, so she and her teammates watched the Huskers take down Florida from the school commons. Now it’s Zimmerman’s turn. This season, she has played in five of Creighton’s six matches so far and has 16 kills with just five errors. On Thursday, Zimmerman is going to share the court with Densberger once again. At Malcolm, they formed a dynamic duo that led the Clippers to an 82-11 record over the three seasons they played together. Densberger and Zimmerman have become rock stars and role models for the girls currently on the Malcolm volleyball team, and for the community as a whole as well. Dolliver can’t help but beam with pride any time she gets a chance to see either of her former players on the big screen. Densberger is just as proud of where she came from, so much so that she struggled to find the words to do it justice. For a school and community with such a small population to send players to the highest level of college sports in back-to-back years seems almost unheard of, but Cook had a different perspective. Nebraska has made it to the NCAA Championship each of the last three seasons, capturing national titles in 2015 and 2017 and falling in the semifinals in 2016. Creighton has made the NCAA Tournament in each of the last six seasons with two Sweet 16 appearances and a trip to the Elite Eight in 2016. Nebraska has long been a part of volleyball’s elite class, but in recent years Creighton has made a strong push to join the party as well under Booth’s guidance. This season, Creighton has four in-state players plus another from across the river in Council Bluffs. However, Densberger is the only Nebraska native for the Huskers right now and that is something she said she takes immense pride in. As of Tuesday, ticket sales had surpassed 11,000. Unfortunately, Dolliver won’t be among the thousands in the stands, as much as she might want to. Densberger said to expect the “whole village” to show up based on what she’s heard from family and friends back home. “A lot of people have texted me and told me that they’ll be there, wearing blue and red because they can’t decide,” Zimmerman said as well. No matter which side comes out on top, expect a standing ovation for both teams — and two players in particular — from one segment of the crowd. Thursday’s match, which is set to begin at 7 p.m. and will be televised on NET, will be a celebration of the sport of volleyball in Nebraska, and the guest of honor will be a small village to the north and west of Lincoln.